The RFEF wanted the 58-year-old after Julen Lopetegui was sacked two days before Spain's opening match. Fernando Hierro took charge on an interim basis as they went on to lose on penalties to Russia in the last-16. Ex-Barcelona coach Luis Enrique has now been appointed on a two-year contract. 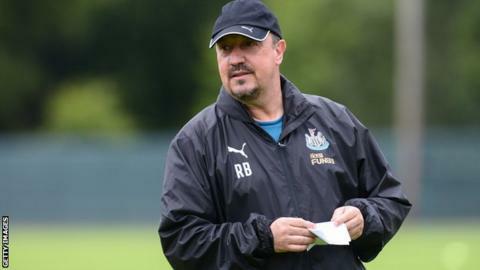 Speaking to the Newcastle Chronicle, Benitez said: "There was maybe a chance, but still I am here and I am happy to be here. There was a chance. There were rumours about that." Benitez has said that Newcastle may have to sell before they can buy players in the transfer window. Newcastle have so far signed goalkeeper Martin Dubravka on a permanent deal after a loan spell last season, former Swansea midfielder Ki Sung-Yueng has joined on a free and they re-signed Brazilian attacker Kenedy on loan from Chelsea. "Unfortunately it's what we have to do," said Benitez, "We have to wheel and deal, that is the way for us. "We have to be realistic with our budget, and then maybe sell some players and buy some players."